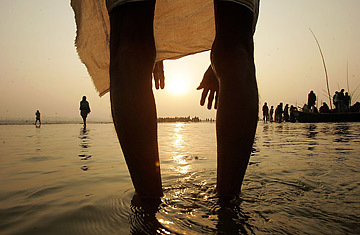 A man reaches for the water while bathing at the ritual site at Sangam, the confluence of the Ganges, Yamuna and mythical Saraswati rivers during the Ardh Kumbh Mela (Half Pitcher) festival January 18, 2006, in Allahabad, India. The Ganges, the most sacred river in India, is so gunked up with industrial and human waste that many Hindus were understandably hesitant about diving in recent weeks to ritually cleanse their souls as their faith directs. But after thousands of holy men threatened to boycott the six-week festival  one of the largest gatherings in the world  while others said they would commit the ritual suicide "jal samadhi" in protest, officials in India flushed the river with water from an upstream dam. Here's how other waterways have fared since their filthy conditions were plunged into the spotlight. After floating debris and oils ignited in 1969, the public outcry over this burning river in Ohio helped spur the Clean Water Act and the creation of the Environmental Protection Agency. Conditions have improved, but the watershed remains an area of concern for the agency. Just when you thought it was safe... In 1972, the Clean Water Act, which called for "swimmable, fishable waters," prompted a Potomac purging. But last fall, the appearance of intersex fish  which have male and female organs  renewed concerns about swimming, fishing and drinking the water. After the Chernobyl disaster in 1986, the river, which flows near the reactor, became radioactive. With toxic silt still flowing downstream in the Pripyat, which is some 441 miles long, a dam on the left bank has been the only effective countermeasure, and dredging remains dangerous. In 2005, when a factory blast in Harbin dumped toxins into the water, Chinese citizens took action. They rioted after discovering the government hid the full extent of the crisis. Following some 50,000 environmental protests, Beijing this month pledged $64 million to clean the river.